"We ain't interested in selling and moving on. This is our land. We fit the Indians and thieves and rustlers to get it. By cracky, we'll take on the whole durned United States Army to keep it. Now get in your car and git." Though many of Gene Autry's western pictures were cheap B-films meant as filler, on occasion he would get a bigger budget for a "special." This film, which anticipates the patriotic fervor of World War II as well as issues still important today, is one such special, and it makes good use of the higher budget to make more interesting and thrilling situations, even if they are patched onto the usual threadbare story cloth. Gene is a sergeant in the Army (three years later, he would in real life become a sergeant in the Air Force) who along with his friends Frog (Smiley Burnette) and the singing Hoosier Hot Shots, is at the end of his enlistment. He convinces them to re-enlist, only to end up with a special assignment in the town of Colby, where he must pretend to leave the service and be a rancher. The Army is using its condemnation powers to take the Colby Basin for use as a military bombing test area. The area ranchers, led by Gabby Whittaker (Gabby Hayes), are none too happy about this state of affairs, and the Atlas Borax Company, which has a mine in the area, encourages that unrest in hopes of getting a higher price from the government. Things quickly come to a head between the ranchers and the military, with Gene and his friends (who have deserted to be with him) in the middle. The budget really does show here. There's a massive shootout finale with the cavalry, complete with a tank being driven by Gene and Smiley, as well as the ranchers on horseback and buckboard. There's a great sequence with Autry racing a train on Champion to try to get them to slow down lest they hit cattle and ranchers up ahead. And there are not one but two sidekick figures, Smiley and Gabby, and it's hard to dislike any picture that has Gabby Hayes in a prominent role. The Hoosier Hot Shots, who on occasion played on tour with Autry, contribute to the larger-than-usual slate of songs. Radio hillbilly comics Sarie and Sallie make an appearance too. The politics of this film are pretty intriguing. Autry makes an appeal to patriotism and preparation of the military at a time when America was still deeply isolationist, complete with newsreel footage of war scenes from the Far East and Europe. The power of the government to condemn is still an issue, as seen in the recent Kelo decision from the Supreme Court has demonstrated. Autry steers a careful course between the desire to hold land and defend one's home and the appeal to a broader sense of duty to the nation. The rather casual treatment of desertion seems somewhat odd, given the militaristic bent of the rest of the film. Despite some briefly-voiced concerns about fairness, the Army seems rather cavalier about using the proving grounds while civilians are still living and working on them, dropping bombs into the middle of cattle herds. At the same time, the mining corporation is clearly painted as the bad guy, willing to incite open warfare and even commit murder in order to profit from the war effort. Autry is enthusiastic in this picture, rather than going through his paces as he sometimes would do. Gabby Hayes is entertaining as usual, with an amusing running gag about the medal he wears. Smiley doesn't have a lot to do, but he does have some good bits scattered throughout the film. June Storey is pretty colorless for the first 45 minutes, but when tragedy strikes in a fairly shocking way, she is bitterly reproachful to Autry, making him look and feel guilty in a way he seldom appears in his films. That sense of responsibility is underlined by a tear-jerking performance of The Vacant Chair by the two of them, with Autry completing the song as she looks on in fury. Special indeed, to have such complex feelings between Autry and a leading lady. This is more than the usual romantic misunderstanding that one sees as the complication in these films, with a piquance that's quite moving. The songs are numerous, though not all are performed by Autry. He teams with the Hoosier Hot Shots for a lovely rendition of the classic Tumbling Tumbleweeds. The Hot Shots have a definite good time with a novelty performance of Virginia Blues. The other songs (not all of which are indicated with chapter stops) are Columbia the Gem of the Ocean, Little Pardner, My Buddy, Born in the Saddle, It Looks Like Rain, and It Happened in Monterey. Image Transfer Review: A fine range of greys is evident on the original full-frame picture. There's a fair amount of grain, but it's decently well-rendered. Black levels are nice, as are details and texture. There's some flicker and a bit of gatefloat in the end credits, but on the whole it's quite satisfactory beyond the unsurprising speckling and minor dirt. Audio Transfer Review: The 2.0 mono English track has quite a lot of noise and crackle on it. Beyond that, the audio sounds fine for the period, with little in the way of low bass and slightly shrill strings in the library score. Dialogue is clear throughout, except the Sarie and Sallie sequences, which are sometimes difficult to make out due to the dialect humor. Extras Review: Once again there's a broad array of extra material provided. The 1987 Melody Ranch Theater (12m:35s) introduction allows Gene to give some anecdotes about co-star Stuart Hamblen (the Cowboy Preacher) and General Patton as well as his wartime experiences. Wartime is also the theme for the Melody Ranch radio show for August 2, 1942 (29m:48s), retitled for the duration as the Sergeant Gene Autry Show. The show dramatizes the situation faced by the newly-minted Sergeant as he joins the military, but there are also opportunities for a couple songs. There are some racial references to the Japanese typical of the wartime period. The Horseplay section has plenty of text and gallery material to boot. Production stills and poster and lobby card galleries contain over 100 images, and there are excerpts from both the American and British presskits. A collection of production documents includes correspondence regarding the Hot Shots, who were concerned about their treatment in the film, and suggestions as to what may need to be censored for various audiences, including the singing of a hymn for British audiences and Gabby Hayes saying the word, "belly" (all these questionable moments seem to be intact here). 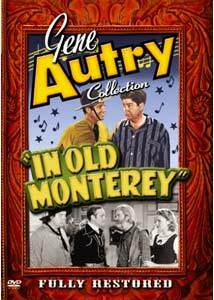 There's a review from Variety that gives the film high marks, as well as a bio and filmography for Smiley Burnette (as well as his own gallery with 19 more images), a text article about Flight Officer Gene Autry (with a 14-image gallery) and filmographies for both Autry and Gabby Hayes. Closed captioning, present on some earlier volumes, is unfortunately absent in this round. It has nothing to do with Monterey, nor is it set in the olden days, but it's nonetheless one of the more entertaining entries in the Autry canon, helped by the bigger budget. The usual sparkling restoration is evident, complete with the typical passel of extras.